arby wrote: I've enjoyed all the puns. Unfortunately we didn't know about Push until after our trip so we never got to experience him. Oh well, it sounds like it was a waste of time but I certainly don't want to trash his existence. Seven Dwarfs does look amazing! Since I'm not well traveled, perhaps someone more educated on the matter can answer. Is this the first time tilting train cars has been attempted on a coaster? I'm really looking forward to trying them out. Well, don't the Arrow suspended coasters have swinging gondolas? But I think it is the first time they have been put on a sitting coaster. Hopefully they are smooth and fun. Yes, you are correct. The Arrow suspended coasters didn't even occur to me. So my question really is whether or not this is the first time a tilting car has been on a sitting coaster. I knew about the Orphan Rocker but didn't know it was going to utilize swinging cars. Find it amusing that it is still listed as "Under Construction". Seven Dwarfs Mine Train is looking amazing. I love the little details they are putting on everything, including the trains. Every night around 15 minutes before the fireworks shoot off, guests walking through the pathways of New Fantasyland “may get wet.” That phrase sounds familiar to guests who’ve seen Fantasmic!, but why would it happen in New Fantasyland? Well, because the area is significantly closer to the fireworks launching pad than theme park buildings have ever been.. So Disney built in a sprinkler system that would wet down the roof of the buildings to prevent them from catching fire. Tonight, something went wrong with that system. The roof of the Journey of The Little Mermaid attraction was briefly lit on fire by falling debris from the fireworks and then relatively quickly extinguished with a fire extinguisher. Small spot fires are actually not that unusual in the brush area behind Fantasyland. You can see them from the train when you ride around. There was even a time in 2001 when one of the spires of Cinderella castle had a post-fireworks burn. But this very visible flame was a first for New Fantasyland, perhaps that dragon from the opening of the land finally came back. Here’s some YouTube footage courtesy of R.A. Pedersen (aka @Epcyclopedia on Twitter). Pederson says the fire started small but grew to include some of the rockwork before it was put out. The area and attraction was evacuated while things were checked out and then it was re-opened before the park closed. No reports of any injuries either according to Disney’s statement to the press. Thanks! It's interesting that nobody else has tried this interesting concept for a coaster train. If anybody can pull it off, it will be Disney. Moose wrote: ^Isn't this a "Vekoma"? From what I recall, yes. The manufactures make what the parks pay them to make, though, is what I was referring to. While Premier made Revenge of the Mummy, and Universal keeps up with it well, there are other parks that couldn't pull it off. I'm assuming there is going to be extra work maintaining this ride but Disney can pull it off. Disney is known for its ability to spark wonder in all of us. In that spirit, we at AT&T imagined a network blueprint to provide connectivity for Disney Cast Members and Guests at Walt Disney World® Resort and Disneyland® Resort. Throughout 2013 we talked about the variety of tools we use to provide an unparalleled network experience for our customers. As part of our new role as The Official Wireless Sponsor for Walt Disney World® Resort and Disneyland® Resort, we made the magic happen by activating a combination of 3G and 4G LTE technologies. For the first time ever, we deployed outdoor Distributed Antenna Systems (oDAS) and indoor DAS (iDAS), repeaters and small cells on a large scale at one location. Both small cells and DAS are part of our Project Velocity IP (VIP), which is geared to help densify our network coverage. We have completed the successful deployment of more than 350 small cells, 25 DAS systems and 40 repeaters at Disneyland® Resort and Walt Disney World® Resort properties. We’ve deployed specialty network solutions at the Magic Kingdom® Park, Epcot®, Disney’s Hollywood Studios®, Disney’s Animal Kingdom® Theme Park and Downtown Disney® Area at Walt Disney World® Resort near Orlando; at Disneyland® Resort in Anaheim; and at Disney Resort Hotels in Hawaii, California, Florida and Hilton Head, South Carolina. While these solutions are designed to go unnoticed, blending seamlessly into the aesthetics of the Disney Parks and Resorts, their impact has been easy to see. Small cells have provided coverage boosts in areas with geographic cellular challenges and are mostly located in offices, administrative areas and tunnels used by cast members. In both Orlando and Anaheim, our engineers have found the areas with small cells have experienced a more than 10x increase in mobile voice and data traffic on our network. And at the Magic Kingdom® Park at Walt Disney World® Resort, our monitoring has shown the DAS technology has consistently received high marks for network voice and data reliability. While early marks show solid performance, our work is not yet finished. We plan to participate in the deployment of additional cell sites across the Walt Disney World® Resort property, and as this world-renown destination continues to build and expand, we will be there to bring wireless connectivity to each new area. Starting today, Disney's Magic Kingdom guests will have to fork over a few extra dollars for single-day park admission. This is the second price hike in less than a year. Universal Orlando also raised its prices last summer. A one-day, one-park ticket is $92. 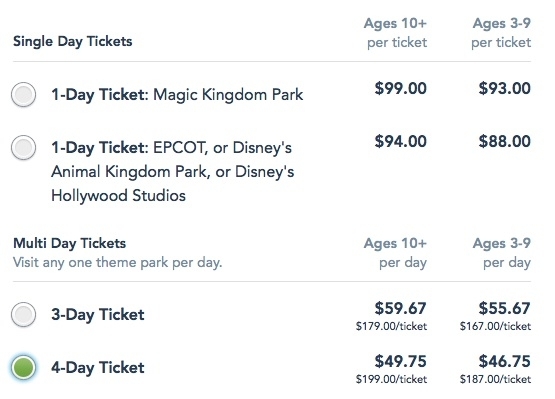 For a full listing of Disney ticket prices go to disneyworld.com/tickets. New ticket prices will be reflected on Sunday. I just hope they only bump it up a dollar at some point so that it can be an even $100.